What are those little whites lines near the punt of a Champagne bottle? 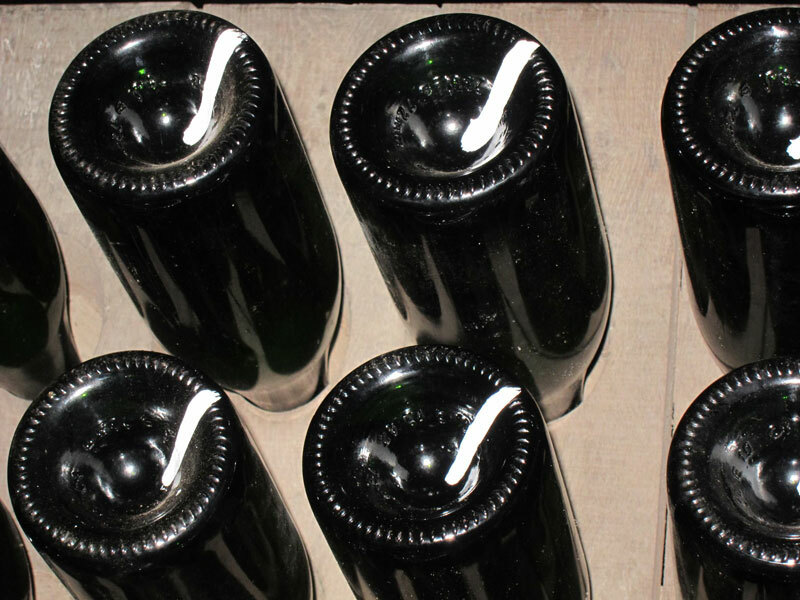 What does dégorgement mean and how does it work? What is the difference between appellation (AVA) versus grape varietal? And finally, what is Noble Rot? You’ll find all the answers to these questions in the following wine facts. The making of Champagne or sparkling wine is a fascinating process that requires multiple steps. One of those steps is called “riddling” (remuage in French). With the help of our good friend “gravity”, this specific procedure called “Méthode Champenoise” – which originated in Champagne, France – consists in gathering all the yeast and sediment of the wine towards the neck of the bottle, only to be removed later before final corking. Resting by the neck in multiple precut holes, a total of 60 bottles are positioned horizontally on a vertical board (aka: pupitre). Over the course of 3 to 4 weeks, those bottles are rotated 1/8th of a turn on a daily basis. Some days the bottles are quickly shaken to loosen the smallest particles. At the beginning of the third week, the bottles are tilted very slightly over time, until they end up in a quasi vertical upside down position. This tedious, yet crucial process has been replaced by machines with computerized pallets since the 70’s. These gyropalettes have been designed to perform in days what takes around 4 weeks to do by hand in the traditional manner. They can handle up to 500 bottles, and are used increasingly worldwide. Other methods are also used experimentally across the world, such as centrifugation or the insertion of alginic acid in the wine which attracts the sediment and facilitates sedimentation and removal. That said, the hands and savor-faire of the riddler (remueur in French) is arguably better than any other techniques, and this Napa Valley winery couldn’t agree more. Schramsberg’s master riddler Ramon Viera has been with the winery for approximately 35 years and turns between 30,000 and 50,000 bottles per day! So what about those white lines? Any guess? They are simply there as a visual reference to remind the riddler how much to turn the bottle. At this stage, the wine is far from finished. 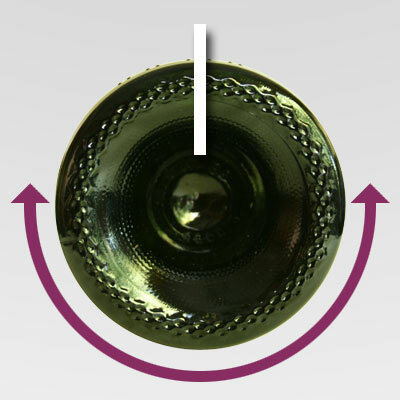 After being “riddled”, the wine is mature and ready for the market, but the deposits are now glued to the cork and need to be removed by way of a procedure called dégorgement. In this process, the temporary cap is carefully pried off, allowing the internal pressure in the bottle to shoot the sediment out; this is sometimes done after the neck of the bottle and the deposits have been frozen (à la glace vs. à la volée). 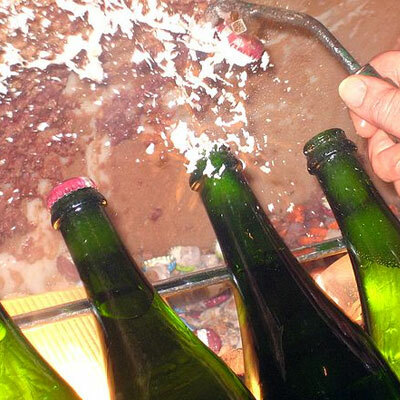 After dégorgement, a small amount of syrup melted in old champagne is added to the bottle. The amount of sugar added to the wine will define its sweetness based on a strict regulation chart. Once the desired sweetness is obtained, the wine is recorked, sealed, labelled and ready to be shipped. A solid experience and a nifty technique are required for this job. A seasoned laborer will dégorge up to 400 bottles per hour! Once again, this traditional method is slowly being replaced by machines. French wines are generally labeled by their appellation or region (i.e. 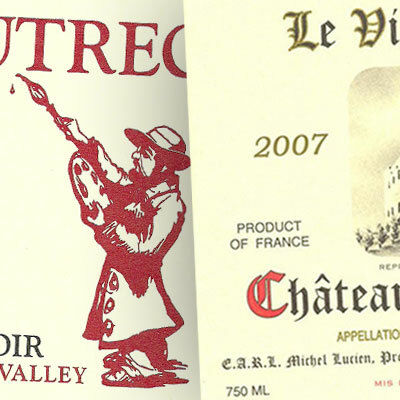 : Bordeaux, Burgundy, Rhône, etc…), whereas American or “New World” wines tend to be categorized by grape varietal (i.e. : Cabernet Sauvignon, Chardonnay, etc…) So when you see bordeaux on a wine label, what’s inside may include a variety of grapes, but will typically fall within a certain style of winemaking, specific to the château or estate (winery). A good example is the world renowned Châteauneuf-du-Pape from the Rhône region of France. The label contains lots of information about the wine, but none about the varietals used to craft the wine. Little did you know that Châteauneuf-du-Pape follows strict regulations and blends multiple grape varietals, most of which from the Rhône region. On the other hand, Lautrec Pinot Noir from the Toulouse Vineyards winery features a very simple label that only shows the name and the type of wine. 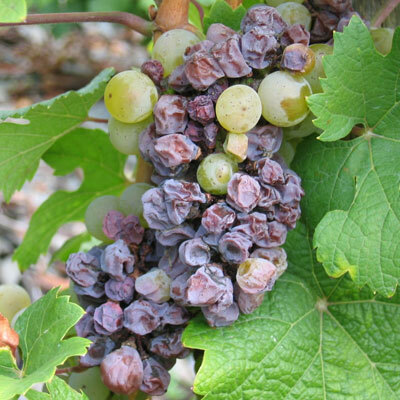 Noble rot (pourriture noble in French) is a gray fungus – aka Botrytis cinerea (derived from the Latin for “grapes like ashes”) for the scientists. This is a fungus that affects many plant species, although its most notable hosts may be wine grapes. In spite of its off-putting looks, it is a very important mold in the viticulture industry, where it is commonly referred to Botrytis bunch rot. This complex fungus gives rise to two stages of infection. The first one occurs under wet and humid conditions (gray rot). The second one needs drier conditions which removes water from the grapes, leaving behind a higher percent of solids, such as sugars, fruit acids and minerals (noble rot). This beautiful mad science procedure – yet entirely natural – results is distinctive sweet dessert wines (or botrytized wines), such as Sauternes or the Aszú of Tokaji (from Hungary and Slovakia). Grapes must be picked at a certain point during infestation in order to produce a more intense, concentrated final product. Some of the finest Botrytized wines are literally picked berry by berry in successive tries (sélections in French). Botrytis has also been imported for use by winemakers in California and Australia. In some cases inoculation occurs when spores are sprayed over the grapes, while some vineyards depend on natural inoculation from spores present in the environment. • Learn about the origin of noble rot and how it came to be know as the “late harvest wine” in Wine Stories [Part 4]. Need more wine facts? Check out the past 5 wine facts (part 1, part 2, part 3, part 4 and part 5) and impress your friends and colleagues for being so “wine smart”.